Before I get into the recipe sharing, I want to encourage you to enter my first ever giveaway! 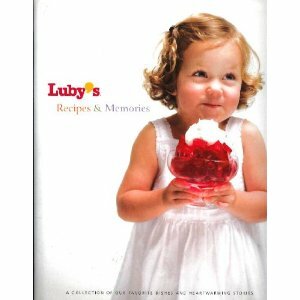 I would love to pass on this Luby’s cookbook (valued at $24.95) to one of you. Personally, I love cookbooks, especially those with recipes for simple side dishes and desserts. If you have never eaten at a Luby’s, just trust me when I say that you would LOVE it! For a chance to win the cookbook, you can enter in the ways listed below. Think of these entries like raffle tickets. Make sure you leave me a separate comment for each entry. I am going to use random.org to select the winner and there has to be separate comments for each one. I will pick the winner and announce it NEXT Saturday, March 19th. Last week I posted a recipe for Southwest Chicken Breast. There were quite a few ingredients in the dish, but it was so very good and worth all the chopping! This week I thought I would include a simple side dish. I love receiving recipes for just basic stuff sometimes. Someone in my family almost always orders the macaroni & cheese (me! me! me!) when we go to Luby’s. Here it is! 1. Preheat oven to 350. Cook macaroni 1 to 2 minutes longer than package directions so pasta is soft but not mushy. Drain. 2. In a large mixing bowl, combine dry milk, flour and until smooth and creamy, about 2-3 minutes. 3. Fold in macaroni, 1 more cup of cheese and salt. 4. Transfer to a lightly greased 11 x 7-inch casserole dish and cover with foil. Bake 25-30 minutes or until sauce in center of casserole is thick and creamy. 5. Remove foil and sprinkle remaining 1 cup of shredded cheese evenly over top. Return to oven until cheese melts.